Cincinnati Ohio is home to a diverse group of shortline railroads. 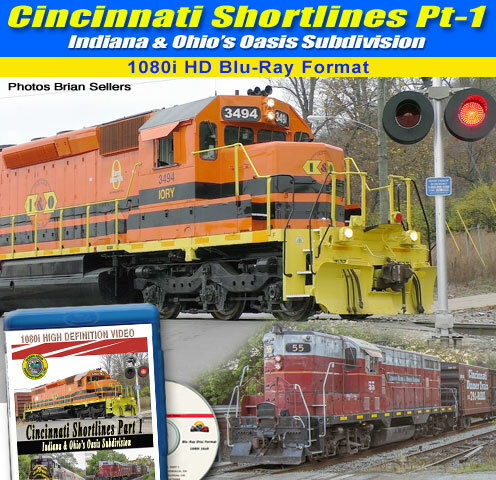 In volume-1 of Cincinnati Shortlines we’ll cover the Indiana & Ohio’s Oasis Subdivision. Much of this former Pennsylvania railroad route is part of the oldest railroad in Cincinnati dating back to 1837. Today it’s home to both freight and passenger trains from the I&O, Norfolk Southern and Cincinnati Railway. In this program well see a variety of footage from the ground, as well as on board the Cincinnati Dinner Train. Don’t miss this exciting program, Cincinnati Shortlines Volume 1 – Indiana & Ohio’s Oasis Subdivision.